Background: Why lower socioeconomic groups behave less healthily can only partly be explained by direct costs of behaving healthily. We hypothesize that low income increases the risk of facing financial strain. Experiencing financial strain takes up cognitive 'bandwidth' and leads to less self-control, and subsequently results in more unhealthy behaviour. We therefore aim to investigate (i) whether a low income increases the likelihood of experiencing financial strain and of unhealthy behaviours, (ii) to what extent more financial strain is associated with less self-control and, subsequently, (iii) whether less self-control is related to more unhealthy behaviour. Methods: Cross-sectional survey data were obtained from participants (25-75 years) in the fifth wave of the Dutch GLOBE study (N= 2812) in 2014. The associations between income, financial strain, self-control and health-behaviourrelated outcomes (physical inactivity in leisure-time, obesity, smoking, excessive alcohol intake, and weekly fruit and vegetable intake) were analysed with linear regression and generalized linear regression models (log link). Results: Experiencing great compared with no financial strain increased the risk of all health-behaviour-related outcomes, independent of income. Low self-control, as compared with high self-control, also increased the risk of an unhealthy lifestyle. Taking self-control into account slightly attenuated the associations between financial strain and the outcomes. 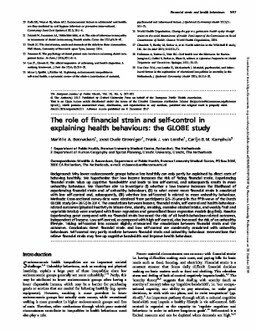 Conclusion: Great financial strain and low self-control are consistently associated with unhealthy behaviours. Self-control may partly mediate between financial strain and unhealthy behaviour. Interventions that relieve financial strain may free up cognitive bandwidth and improve health behaviour.